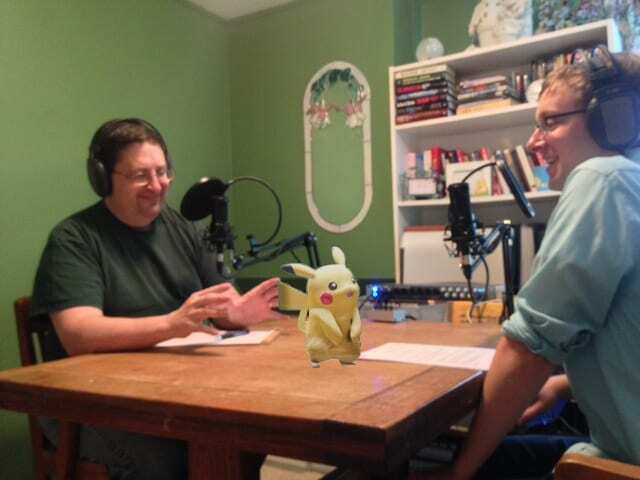 Today, on Episode 11 of the Edge of Innovation, we talk with Steve Miller about the amazing new world of Pokemon GO, and explore the questions raised by augmented reality, in terms of social dynamics, privacy, and business opportunities. Paul: Well welcome to the Edge of Innovation Podcast, I’m Paul Parisi and I’m here with our special guest Steve Miller, who is the director of Pokemon Go Theory and Evolution for SaviorLabs, the company we both work for. Steven: Just recently promoted to Senior Director. Steven: Analytics and research, I think. Paul: Analytics and research. So we’re getting you new business cards, but you know, we like to be responsive in the market, and we’ve seen Pokemon, and we’re shifting all of our resources to Pokemon. Paul: Yes, absolutely, cause it is so fulfilling. Steve is a twenty-something. You’re still a twenty-something? Steven: Yeah, will be for a little while. Paul: Well, I’m a fifty-something, and I was there, as we were joking earlier, when video games became video games, with Pong and things like that. I can remember when they came out so, hey ya little kids. So we have this phenomenon of Pokemon GO that has just sort of blossomed out of nowhere. We just thought it would be interesting to kick around some of the ideas that are going on there, some of the technologies, some of the social changes, and really have a good discussion about that. Steven: Well, maybe before we go further, and let’s back up a little bit and talk about the basics of Pokemon GO, just in case some of our listeners are not aware of what’s going on at this point. Pokemon, for those that don’t know is a cartoon series, a video gave, a whole industry, basically, that’s been around for about 20 years now. And it began, I believe, as a video game on a handheld game system. And the point of that game was your little avatar character walked around this virtual world and had to “Catch” them all, catch all of the Pokemon. The game was very open-ended. It was very free. You could go at your own pace. You could catch all or a few Pokemon, if you wanted. You could level them all up, or you could stop early. It was not a perfectly linear game. It gave you a lot of freedom and flexibility. And so the game is iterated on top of that. It’s constantly. It’s been pretty similar formula. That’s what happens in the TV show. That’s what happens with even the trading card game to some extent. And so all of that has kind of grown and snowballed up till this point of Pokemon Go. I was actually, as someone who grew up on video games, was struck by the Pokemon advertisement during the Super Bowl. I don’t know if you saw that or not. It was really interesting, because it was clearly geared toward someone my age, because it shows these younger kids running around doing cool things, but then at the end, there’s a youngish dad with his child, and the child, they’re playing Pokemon together. So, it’s all of a sudden, it seems like Pokemon is realizing that there’s this… They have two generations now that they’re targeting instead of one. And I think that Pokemon Go has kind of come in to fill that gap. And so, with Pokemon Go, we all of a sudden now have the old game fundamental of walking around in a world to catch Pokemon, except now it’s moved to your smartphone. And you, a real person actually moving in the real world, affects the Pokemon that you can catch. And so the basics of the game are you open your phone, you flip it on, and you’re brought to a map overlay, and you can kind of see different things around you. You can see where Pokemon might be. You can see areas where you can get items. And it requires you to actually move and go get those things. And like the old games, it’s not perfectly linear. There’s no set end point. You’re not required to catch them all. You can kind of go at your own pace, and you can do what you want. But they’ve moved it into the actual physical world of moving around. So, I’ll stop there. That’s a quick, a very brief history of Pokemon, but what are your thoughts? Paul: Let me ask a question about that. In the old world, when they had the game, was there any collaboration with other people? Steven: Yes. And Pokemon has traditionally encouraged getting together with other people. And so, the game boy, if you picture it, it’s a handheld video game system run on AA batteries. No near-field communication or anything like that. Actually, it might have had, the red infra sensor. I’ve forgot what it’s called. Steven: Infrared. But you could interact with other people. You could trade the Pokemon that you’ve caught by connecting a cable together. And you could even train up your teams, and then fight other players with your Pokemon. But you had to be in the same room with a cable connected. And that’s evolved through different ways. You can do it purely over the internet now, but there’s still a strong encouragement to be near each other and trade Pokemons as you pass each other on the street. There were still things like that in the games before Pokemon Go. Paul: So, it’s interesting. So, it sounds like the game that’s been released is really nothing more than the old game, except it’s mapped into an augmented reality. Steven: It is. Yeah. And it’s gone back to some of the simplicity of the old game. I will not go into the technicals of Pokemon. But basically, when something iterates, like, it tends to get more complex. The iPhone has become more complex from the first edition to now. Paul: Right. More features, more functions. Steven: Exactly. Yeah. And so, they’ve taken a conscious step back and stripped it down to the old fundamentals, like you’re saying. Another thing that I find interesting about the target audience, specifically, like I said, it’s targeting two different generations. And just kind of a quick story… The games haven’t just iterated in features but also in the number of creatures or Pokemon that you can catch. This game only includes the first wave of Pokemon currently. And even the kind of like mascot Pokemon for the teams and the things you can do to connect with other people, those are also from that first generation. They’re the legendary Pokemon, is what they’re called, that I know from growing up as a kid. They’re the first ones I was introduced to. There’s nothing that really reaches past that first generation point currently. So, when I walk around at night in my town, and I see people, I’m seeing a lot of people my age out there catching Pokemon on their smartphones. And it’s just… It’s bizarre. Paul: Let’s go back a little bit. What prompted you to download it? Was it the buzz? Was the buzz overwhelming, so that you just said, “I’m going to download this.” Or was it that you evaluated it before you downloaded it? Steven: I, personally, was very driven by going out to do it with friends. Paul: Okay. So, hold on. How did you become first aware of it? Steven: The internets. Yes, the plurals. Paul: So, you read something about it, a post about it, that, “Hey, there’s this new thing”? Paul: Alright, so, when was that? That was like Friday, right? Steven: It’s been known that it’s been coming out for a while before that. It came out on Thursday. I was aware of that. Paul: So, you were aware that it was coming on Thursday. Steven: I think probably because my social media friend groups were aware of it as well. Paul: Did you download it before the explosion happened or after? Steven: I mean, in internet terms, I was late, which probably means I downloaded it a day after it released it or something like that. But I’ve been playing it over the weekend on and off. Paul: Well, what I’m interested in is trying to tease out why people downloaded it. Was it they were anticipating it? I mean, there wasn’t a lot of detail about it beforehand. So they didn’t know what to anticipate, except there was this new thing coming out. Was augmented reality a known thing? Did you know that augmented reality in Pokemon was coming? Steven: I did. It circulated! There’s a lot of good writing within games, and a lot of good engagement with it. And I’m just someone who is interested in this. Paul: Okay, so you were generally aware of it. Steven: Yes. But I think it was mostly within the game circle until the weekend when it actually released. So, as someone who consumes game related media, I was aware. But the average person was probably not until it blew up. Paul: So, some of your friends. Paul: Would you characterize those as game-aware people or not, that have chosen to download this? Steven: Yes. Some of them are. Some of them are not. Some of them caught onto the wave. They saw other people playing it and downloaded it. Paul: And were the people that… Let’s just think of one of those people that caught on to the wave. They weren’t game people, but downloaded it as a follower, basically. Were they aware of Pokemon, and they understood the context of Pokemon? Or was it just, “This is a neat new game”? And so he, actually… I don’t think this friend ever grew up playing Pokemon, but he rode that wave of external hype at that point. So, he’s not a read-up-on-games that are coming out. He’ll play casually, but yeah. So, I’m a Pokemon person. I like that. I’m going to download this whether it’s good on not. And it sounds like there’s a mix. Certainly the ones in the culture knew it was coming. But then it had enough — which I think is really intriguing about this — is it has enough social juice where it became collaborative for a common experience, which I think is really wild. Because we don’t see that in games. You know, Angry Birds doesn’t have that. None of the real games out there. And I’m not a gamer, so you might say that there are other examples. Are there any other examples that perpetuate a social engagement like this? Steven: Yeah. Absolutely. I had never heard about that before. I think that it had same sort of social interaction, walking by people. Paul: What’s interesting is Ingress doesn’t have the stored up value of Pokemon. And so, it doesn’t have the connection. I’m pontificating here. I’m saying does… It didn’t have the initial stickiness or any… There was no handle on it, that somebody that wasn’t involved in it, to be able to grab on to it. Whereas, almost everybody on the planet has heard of Pokemon, regardless of your age. “Oh, what’s that about?” And you might have it in the context of a game or cards, whatever it was, or a movie. But that additional handle really changed the value proposition for an Ingress. So in some ways, you know, I’m very fascinated to hear the interviews that come out with the team to see if they had any notion that it would have this type of viral effect. Steven: Yeah. That’s a great question. Thinking from the point of our typical topics on the podcast of business and technology, talking about kind of that, bringing in the marketing, everything behind it, kind of the stickiness, like you were saying… It kind of feels like when Facebook released messenger. It’s, you know, Facebook owns the internet in many ways. And messenger, if I recall correctly, wasn’t that great of an app when it first came out. It just existed. But we all had to use it, because we were all Facebook already. And so messenger is successful, not on its own merits necessarily, but on the merits of Facebook. And I’m wondering if there is… I mean, I’m not signed up to Pokemon, per se, in the same way that you’re signed up to Facebook. But there is a carryover of merit, so that, okay, Pokemon has moved to my smart phone now. I’m not used to this. It’s moved to walking around, but I’m interested, because I’ve been interested in Pokemon before. And so, there’s that same kind of… This app has almost borrowed both technology and marketing from external sources. The tech’s already built. The marketing’s already built up. It’s just taking what’s laying on the floor almost and putting it together. Paul: Well, and it also has the aspect, which doesn’t seem to be a mainstream aspect, of you being able to say, “Hey, have you seen this? Hey, we can go do this together. We can go walk around the real world and capture these fun little things.” So, to me, that was sort of the gee-whiz, wow, because it’s got people walking around together, socializing. So, you know, we are critical — and I think in some ways, video games are very insular, you know. You sit in your own room. And you may be talking to people across the world, but you don’t go outside. And now, we have this video game that is compelling people to go outside, and it’s funner to do it in a group. Funner? Is that a word? Steven: Yeah, grammatically correct. Yeah. Paul: It’s more funner to go out and do it in a group. So, it’s just a wild twist to me that all of a sudden, we have something coming from this — you know, I’m always looking at my phone that is almost mandating that I go out with a group of people and enjoy this together. Steven: Yeah. So, there are the Pokemon wandering around out there. You actually have to walk close enough to one to capture it, but your phone will give you an option to say, “Okay, as you’re…” And when you’re in the capture phase of the game, you have the option to turn on augmented reality, and all of a sudden, the Pokemon, that was just on your screen before with a kind of normal backdrop, is now placed into the real world using your phone’s camera. And so I have a goofy picture of me, for example, with a Pokemon sitting on my belly or something like that. But that’s become part of the phenomenon, is people taking pictures of Pokemon in weird places. So, there’s this bird Pokemon just sitting on the floor in your kitchen or there’s just all these different kinds of aspects that have shown up. And so that augmented reality feature of it is another strange but good collision that’s kind of enhanced it. It’s that shock and awe, initial value of, “Oh, there’s a thing I know in a place it shouldn’t be,” almost. Paul: Right. Well, there’s been a lot of talk over the past 20 years about virtual reality and how that was sort of the be all to end all. And, you know, something weird happened about a year and it half ago when Microsoft talked about their new product, HoloLens. And it was this thing, you know, you put on your face. You can still see, but it projects images out onto the wall or your refrigerator or whatever it might be. And so, people are looking at that and saying, “Gee, I really don’t know how that works.” You know, I don’t know how that feels. I get the idea of virtual reality because I’m in a place that I’ve never been in or am not in right now. And I can get up and walk around and touch things, or not really touch them but, you know, look at them and turn around and see somebody behind me. That’s virtual reality. But augmented reality sort of caught us a little bit by surprise, at least it did me. It’s like, “What are you doing, you know, Microsoft? What the heck is it this thing? And I don’t need to see a spreadsheet on my refrigerator, I don’t need to see a Word document on my wall.” I might be cool, but… All of a sudden this comes out and shows us augmented reality done right. It’s just an incredible opportunity for us to see that, actually, I think that we thought virtual reality was going to be the be all to end all. But now we’re, I think we’re learning that augmented reality may be the be all to end all. Steven: Yeah. That’s true. Google Glass received, for example, a lot excitement around when it first came out. We may learn… In the future, we may learn it may have been ahead of its time, which I’m not sure that works timewise. Paul: That’s true. That’s true. I think… Yeah. It was a technology dying for an application. I think if we had the Pokemon Go on Google Glass, it might be a different acceptance rate. Steven: So, many people would be injured and dead right now if that’s true. Paul: You’d have to wear big bumpers. Steven: Playing Pokemon Go right now, please do not disturb. Paul: So, one of the initial questions was that it’s all free. How do you earn money? As it’s emerging, you can buy different things in the game, what are some of the things you can buy, Steve? Steven: Yeah, so within the game, basically, it follows somewhat the trend of normal, mobile games. You can do everything without paying. But if you want to accelerate the speed at which you play the game, if you want to make it easier for yourself, you don’t have to walk as far. You can buy abilities to have more Pokemon appear closer to you. Or you can buy extra materials that help you catch Pokemon, rather than having to travel around and collect them yourselves. The game doesn’t have– It’s not what we would necessarily call pay to win, I suppose. There’s no wall point at which you can’t pass if you don’t pay. Paul: Okay. So, there’s nothing preventing you from playing. Steven: Exactly, but you can make it easier to play, basically. I do have some numbers here, speaking of the prices. It’s projected to hit $58.2 billion this year. Paul: That’s just for people seeking to do something more in the game. Not changing the game experience, but helping them with the game. Fascinating. And they’re going to go to $76 billion in 2017, which is actually a drop, because 58.2 for half a year would be 116 billion for the total year. So, that’s interesting. I don’t know. I mean, this is data gathered by Statista, I don’t know what their metrics or methodology was there. And I think this is a really great example to show you that that is just so wrong, because there are so many things that can be invented. Not that this is an invention, because they just took conventional pieces and put them together. And it’s a delight to see this and it not be, you know, something weird or terrible but accessible by the full spectrum of people all over the world. You know, whether you’re six or you’re 60, you could use this game and enjoy it. Steven: Yea, so the game has gained both money. It’s also gained extreme traction in terms of number of users. I believe that it surpassed Twitter already in daily active users, which is pretty incredible, considering it is not even released in every country yet. It’s still, I believe, the United States and Australia. Paul: Right. But Twitter is a very vertical product. It’s not a general interest. So, I think it is incredible traction. I mean, if anybody can get the traction that Twitter has, they’d be delighted. So, for this to do that, just really establishes that it’s a great idea. Steven: I have an important question for you. Steven: Have you caught them all? Paul: No. No, I actually can’t figure out how to get it installed. No, that’s not true. I just didn’t have my Google password with me. I thought it was interesting that they chose to use authenticate with Google. Steven: Yeah, did you read about the Google authentication with iOS? Paul: Well, I heard you tell me about it. But I didn’t read about it yet. Steven: Yeah, so apparently, Google was taking all of your information on iOS, or rather, the app was. It was requesting full permissions from Google, which is something only Chrome and Gmail use. Paul: Right. Yeah, I think it’s interesting. I mean, there’s a lot to talk about with this, and, I think there’s a lot of societal things, there’s a lot of technical things. But, you know, it points out that humans are driven by engagement. They want to be engaged with whatever is going on and what’s interesting. And that’s… I mean, if a million people find something interesting, it’s probably interesting. Steven: I’ve only actually ever had one app that said, “This does not require permissions.” It’s my favorite app, probably, just because of that. Paul: Which app is that? Paul: Yeah, it is very interesting. I mean, you know, when you look at the different rights or permissions that are asked, even across the platforms, iOS and Android. You know, Android apps tend to ask for everything. IOS, because of the App Store and the overruling of the Apple god, they don’t ask as much. But one of the things that you have to realize, that when you opt in or you sign up with Google, you’re giving Google access to all of your information — not just the app maker, but Google as well. So, critical things there to think about. We do live in a different world. So, you know, when you’re sharing that information, you’re sharing it with a broader audience than you might think. Steven: Yeah. That’s a good point. Paul: You’re not only giving the app the ability to authenticate you, but you’re giving Google whatever information that app shares with Google. So, you know, Google knows everything. We’re just giving them more and more and more and more and more and more. So, for example, let’s talk about this. There are going to be trends that emerge from your playing this game. And Google can predict where you are, you know. And who you’re with. Steven: That’s a good point. Paul: You know, so now we have clustering. You know, we have the fact that Steve and Bob tend to go on Thursday afternoon for a walk in this area. Now, you know, who can do good or bad with that? You know, I mean, Google with use it, I’m sure, to sell advertising locally. You know, real, brick-and-mortar advertising. So, we know that there’s this many people walking by this spot. This is a good place to put an ad, as opposed to one street over where they traditionally sold the ads, but they don’t… Nobody walks by that, especially for urban settings. So, this big data, again, when it’s… When big data is used in a non-threatening way, it’s a good thing. You know, we’ve talked about the fact that, if, as advertising, matures, let’s say that you’re…we have digital advertising in the future. So, when you’re walking by it’s going to show you ads that are relevant to you. Same thing with the radio and things like that. So, as I express myself in the real world, I give Google more opportunities to target me, because now I know where you are. And so I can change the billboard there to be… Oh, I’ve got 10 people, and they’re all interested in the Celtics in Boston. I can put a Celtics ad up. And I can sell that to them to say these are some people that are looking at it. Steven: Yeah. Going even further than big data, maybe toward the conspiracy theory realms, we’ve got a couple of articles already that have come out saying, you know, is Pokemon Go basically a way to get big brother everywhere now that we’ve got people literally sticking their cameras in places and they’ve got all your geospatial data. Even your Pokemon are tagged as to where they’re caught. So, you don’t even have to be watching live. You could just see where people trend to be. One person was saying, you know… This is a really funny, interesting idea. A user said, “What if that local church is a mosque?” — Talking about an area where Pokemon might be — “they suspect terrorist activity and they want photos of it or photos of the cars around it and their plates or photos of the people coming in and out. Meaning, that should the director of the FBI need eyes somewhere, all he has to do is tell the game to stick a Pikachu in the room, and some unassuming schlub will send him a photo in no time. Paul: Yeah. Absolutely. And there’s some implicit walls built between private and public. So, that may be difficult to happen in the open, but it can happen on the backend, or sly, if you will. But also it gives corporations information that government might not be able to have because of the laws. So, it’s going to be fascinating. One of the things that, you know, there’s an article out that talks about a company called In-Q-tel, and they were interested… We had talked to them about one of the companies I had, about them buying some of the technology. And these are CIA, that type of NSA, CIA people. It is a government organization. And, you know, this is the kind of stuff that makes them salivate, you know. This is just have interesting stuff. To your statement, to say, what about that, or what the article was asking, that is a reality right now that could be happening right now. The only thing that’s a control there is can the agency, the government agency, delegate Pokemon to say, “Put something here.” There’s the only thing that has to happen. And I would imagine they’d find a way to do that pretty easily. It wouldn’t be difficult for us to probably figure out how to do that from social engineering and all sorts of stuff. Steven: That’s a good point. Yeah, so maybe taking a step back and just talking about the issue of privacy as a whole, what are maybe some practical steps listeners could take to prevent this kind of collection or to be careful with it at least? Paul: There isn’t. There isn’t anything you can do. I mean, you’re giving, you’re giving your presence and tying it to a geolocation, you’re also giving your friends- I can correlate that. So, if I don’t like people that like you. So, if want to know who’s Steve’s friends are, this is going to give it to me. And it’s going to tell me where they are all the time. And that’s reality. Anybody can say, “Oh, we’re not using it for that.” But they have it all stored. It’s all there, you know. It would be interesting to see what their data anonymizing policy is. But fundamentally, it has to be tied to you, and you can go back right now, I think, and see where you picked up every, every Pokemon. Paul: So, alright. I gotta take, I gotta slice that whole feature set out to make it, you know, to make it privacy aware. I don’t think that’s going to happen. What’s fascinating here is that, you know, Nielsen Rating Company has always rated TV shows for how popular they were. And they went through a lot of trouble to have a person used to fill out a diary. They would actually write down or check off what they watched. And they would say, “How many people were in the room?” And that worked for a long time. Now then, they moved to an electronic device which would monitor who watched what. I don’t believe it got down to the who, but that there were people in the room, and it was watching a TV, as opposed to an empty room. Now, we have this… One of the things that the internet is really great, and it’s the Holy Grail for advertising is, if I’m browsing the web, and I’m logged into Google, Google knows who I am, and they can push ads to me that I’m interested in. This does it even better. I mean, the cellphone, you know, if you think about it, the smartphone could be a clandestine attempt to just be about to enable tracking of individuals. That’s really, you know, that’s really what it’s really well, is a byproduct of its design, at doing. So, my son has his own cellphone. My daughter has her own cellphone, so that cellphone is inextricably bound to that person. So, you know, it’s unusual that we’re without our phones. That’s a notion of the past. You always have it with you. So, understand that just by using those devices, you’re giving that information away. So, let’s say you have a Gmail account. It’s logged in to your phone. And you, Steve, has a Gmail account. Google, can tell that we’re this close to each other, you know. That we’re in the same room. So, this is just another example of that. It’s not like, “One, two, run,” and say, “Oh, my gosh, I can’t use a phone from now on.” That, that ship has sailed, I guess. Steven: Wow. I know we had mentioned earlier about business possibilities, you know. Inventions don’t require brand new things. Sometimes they require just putting things that exist together, and Pokemon Go is an example of that on a very large scale. Steven: It’s literally just missing the brick that would say, “Oh, yeah. We used this as a dry run.” I don’t know if you have any thoughts about that. Paul: Well, it could be. I think that the most difficult thing in the web… I’m reading a great book which we’re going to do a special podcast on this book coming up. But it’s about how we design and the way we think. And it’s a lot of the psychology behind that. And as I’m reading through it, there’s all these techniques to talk about trigger points or calls to action or this or that or all these different things. But the thing we don’t know is what people will like. And how we can get them to share it in a viral way. That’s what we can’t predict. So, you know, they may have done this to see if there was any traction at all there. But it would be very interesting for me to see the demographics on how the uptake came. So, in other words, why did it break through the gamers, you know, and not just stay in the gamers’ space. Any business you’re going to launch, whether it be a website, a product, or whatever, is going to be successful based on the number of people that know about it and choose to take an action about it. And that’s really the Holy Grail, is trying to get people to be aware of it, and then to make an action, a commitment. What’s interesting, is there’s a group of people called Foursquare which are kicking themselves right now. Paul: They have been working on this for five, six years. And this thing just came out and took it away from them. I mean, now they could… You, they could literally put Pokemon and Yelp into this and sell, socialize it around Pokemon. And that is highly leveragable.